So, you are all about desserts, huh? Well, look no further than the First State for top-notch cakes, pies, ice cream, sorbet, milkshakes, and more. Whether you take your decadent desserts beachside, or you are into a more pastoral setting, you can’t go wrong with a state that even has its own university milking cows. Plus, you will find pastries, muffins, cupcakes, and, other decadent delights. So get ready to fill a sweet tooth or two as we pig out on the best places for dessert in Delaware. This landmark bakery has been churning out breads, pies, and pastries since 1946, making it the First State’s longest-running family-owned bakery. Everything is hand-made daily from scratch, and you’ll find holiday cakes and tarts, fruit pies, custard pies, cookies, fruitcake, cupcakes, pound cakes, and more. Plus, order at the store or online and have one of their delicious confections shipped straight to your door. What is better than getting fresh dairy from the local scoop shop? Going to the source, of course. Woodside is a working dairy farm and creamery featuring house-made ice cream from Jersey cows on their farm. With a list of mind-bending flavor options to choose from, it doesn’t get any fresher than this, and popular flavors include raspberry sorbet, cotton candy, and chocolate peanut butter. 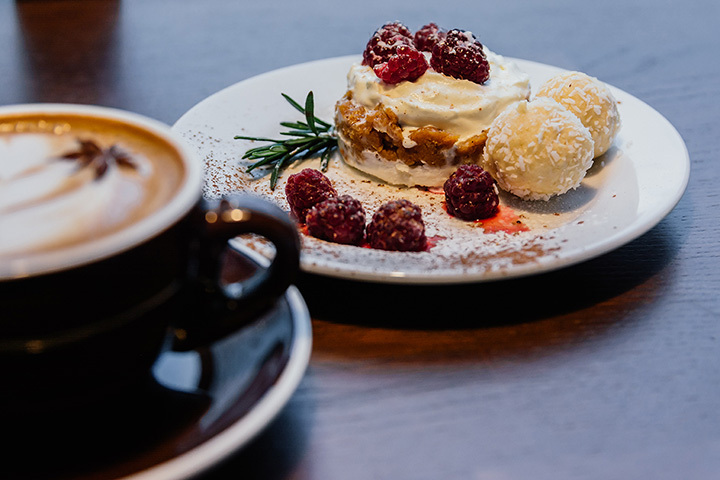 From Austrian roots, by way of France and Washington D.C., Kaisy Delights is one part Parisian cafe, one part Hungarian Polka music, and one part Austrian chalet. You’ll find Polish-French fries, goulash soup, breakfast sandwiches, potato latkes, and sweet indulgences like ice cream, frappes, smoothies, pastries, and the house-made lemonade. When you are looking for a sweet treat, it can be difficult to choose between hot or cold dishes. Well, at Sweet Nel’s you can have your cake and eat it too—if by cake you mean ice cream, and if by eating you mean slurping. That’s because this scoop shop not only serves up Nelson’s Dutch Country Organic Ice Cream and house-made gelatos, but they also boast espressos and lattes made with LaColombe Coffee Roasters coffee beans. Featuring hand-dipped Hershey’s ice cream and Via Veneto Italian Ice, this small dessert stand also has another irresistible lure for both kids and adults alike. What could be more fun than ice cream on a hot summer day, you ask? Ice cream and mini-golf. That’s what. Proudly march that mango Italian ice onto the course and start putting away. The only thing better would be if you had a third hand. This small but favorite ice cream shop features Hershey’s Ice Cream, Italian ice, hot dogs, frozen yogurt, and snow cones. Plus, you’ll find delicious flavors like brownie batter, cookie dough, orange blossom, and White House cherry. And there are sugar-free options, too, like butter pecan, chocolate, and strawberry. This working dairy shop was established by a grant from the UNIDEL foundation to teach University of Delaware students the principles of dairy production. Other topics covered in this college-run business include environmental stewardship, business management, and how to make farming profitable in a modern society. The upshot, is, of course, fresh house-made ice from 100 university Holsteins that free graze on 350 acres. With over 100 hand-dipped ice cream flavors, you’ll find cups, cones, smoothies, milkshakes, cookies and sandwiches, Belgian waffles, and Italian Ice. Plus, you’ll find all kinds of homemade flavors, like waffle cone, buttery salted caramel, and Devil’s Breath Carolina Reaper. With a flavor for all tastes, the Ice Cream Store is you stop on the beach for decadent desserts. If you have got a sweet tooth, Sweet Lucy’s can tame it. We are talking about ice cream sundaes, smoothies, fudge, and hard candy all under one roof. Featuring the locally famous Woodside Farm Creamery ice cream, you can dip it, sprinkle it, add a banana to it, or order straight up, and you will be guaranteed to walk away happy, happy, happy. Serving breakfast and lunch all day, this quaint beachside bakeshop offers espresso, coffee, cold brew, smoothies, sandwiches, pastries, and more. This place is known for their breakfast sandwiches and quiches, but folks also talk about their apple pie, homemade cakes, cupcakes, and sweet and savory crepes.